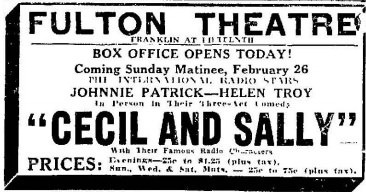 One of the earliest popular old time radio shows, Cecil and Sally broadcast out of San Francisco. It was one of the earliest old time radio shows to be syndicated nationally via electrical transcriptions and by 1930 they had over 15 million fans. The two met while working in KYA radio station in San Francisco where Helen Troy was an organist and Johnny Patrick was an announcer. The two created Cecil and Sally with fun office banter when Helen picked up her mail. She would talk in a baby voice with a lisp and he would speak in a Yiddish dialect. Eventually they came up with skits and put on the air until the working title The Funniest Things first broadcast in 1928. 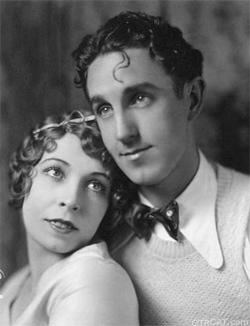 This show soon changed to Cecil and Sally and ran until 1933 as a short format program. Be the first to comment on "Cecil and Sally"